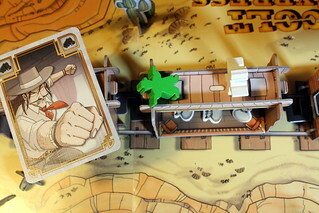 In Colt Express, up to six players try to rob a train. Pay close attention to the wording there, it doesn’t say that they rob the train together. Up to six players, each on their own, try to rob the train carrying the Nice Valley Coal Company’s weekly payroll. They not only have to dodge Marshal Samuel Ford, who is guarding the train, but also have to brawl and shoot each other, running up and down the train, climbing up on the roof, jumping in through the windows again – it’s a scene that should be, if there’s any justice in the world, accompanied by the Benny Hill Theme played on a banjo for all its chaos. Who am I kidding, when I’m playing it does have just that as a soundtrack. I better take this for … um… safekeeping. 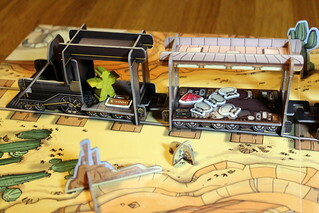 But chaos like that has to be carefully planned, and that’s why you play Colt Express in two phases. In the first phase (Schemin’!) players plan their actions for the round that they then perform on the train in phase two (Stealin’!). After only five rounds of that, the player who stole the most money wins. Colt Express is a type of programming game: all the action you plan in Schemin’ have to be done, you can not skip them if the situation turns out different from what you planned. But you’re not completely in the dark about what will happen. Unlike in other games of this kind, you will know some of your opponents’ moves. The Schemin’ goes like this: taking turns around the table, everyone plays one Action Card from their hand into a common pile (or draws three cards from their deck, if they don’t want to play a card). You get to choose from most of your action cards (six in your hand out of a total ten), but not all of them. Most of those cards are played openly, so the other players have an idea what you are doing. But sometimes, when the train goes through a tunnel, cards are played face down. They can also be played in reverse turn order when the train is switching rails, or two at a time instead of one at a time when the train is speeding up. Those special turns are where Schemin’ gets interesting, because one hidden card can thoroughly confound your opponents about what you’re planning to do, just like two cards at once give you a chance to take big loot from the train without anyone getting in your way. Planning for the specials properly is where strategy comes in. How the cards are played is dictated by the Round Cards: a typical round might have a regular card, a hidden card, two cards at once and another regular card. When the Schemin’is done and the cards are played, the resulting pile is turned over and all actions are performed in the same order they were played and move your bandeeple (bandit meeple, if you have to ask) along the train. And what a train it is, the train is the most magnificent game “board” you can imagine. Artist Jordi Valbuena could have created a simple board, with the interior and the roof of each car painted next other. But that would be boring. Instead, you get a 3D train made from paper pieces, and your bandeeple can be inside or on top. Assembling the train is a bit of work the first time, but it fits the box fully assembled and once it’s built it’s very sturdy, too. The cars are a bit small for German sausage fingers like mine, but they are perfectly usable and this is a case where I value style over fat-finger-friendliness. The paper train is just too much fun. So, what happens when the cards are turned over? That depends on the cards obviously. a Move card lets your bandeeple move to the next car, towards the front or the back of the train, if you are inside the train. On top of the train, with no passengers getting in the way, you can move faster and go up to three cars forwards or back. The only thing you can not do is end your move on the same car you started, if you schemed a Move you have to do a Move. with a Floor Change, you move from the inside of the train to the top, or vice versa. Again, you can not stay put. the Marshal card lets you move Samuel Ford. Marshal Ford is too sensible to climb on the roof of a moving train, he only stays inside. But in the train, he’s too dangerous to be around. When the Meepshal (Meeple Marshal) enters a car, he shoots all bandeeples present (giving them a bullet card, see below) and drives them to the roof. Can you imagine the scene from the outside, three bandits scrambling out the windows and to the roof at the same time? I can, and it’s hilarious. it wouldn’t be the Wild West without some shooting. With a Fire card, you shoot a bandeeple in the next car if you’re inside the train, or the next bandit to either side if you’re on the roof. Being shot is not as deadly as it really is, but it isn’t good, either. The victim takes one of the shooter’s Bullet Cards to his deck. Those cards are utterly useless, so when you draw them to your hand you have fewer options to act. The outcome is much better for the shooter: the player who used most of his bullets during the game wins the title of Gunslinger and $1000, an impressive sum compared to the loot you can pick up. next to being the Gunslinger, your source of income is robbery. A robbery card lets you pick up one piece of loot from your current location. At the start, you only find loot inside the cars, but it can end up on the roof later. Loot is either Money Purses worth between $250 and $500, Jewels for $500 or the Strongbox in the locomotive, containing $1000. but just because you picked up the loot doesn’t mean it’s yours already. With the last type of Action Card, another player can Punch you and force you to drop one piece of loot. The Stealin’ phase is not just stupidly taking actions as the cards tell you, either. Especially for Move cards you still have to make decisions about the direction and, if you’re on the roof, distance that you move. To make those decisions, you should know what the other players are still planning, so remembering what cards they played after your current one and anticipating correctly what they will want to do is important. Of course, where guessing other players’ plans is part of the game, there’s always bluffing, too. Especially in tunnels, playing cards your opponents won’t expect is a promising strategy. Note here that the manual calls the Bullet Cards “dead cards”, but does not actually say you can’t play them. They may not be very useful, but on a bad hand, a Bullet Card in a tunnel can at least confuse everyone else about your position. 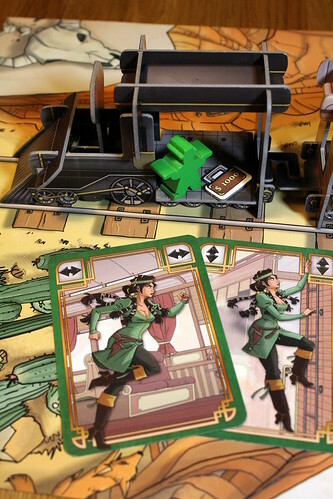 I really enjoy the two stages of strategy in Colt Express. You have to consider cards already played in the Schemin’ phase, but cards still coming in the Stealin’ phase, and all the time you’re guessing what your opponents might do.On top of that, you also have to consider everyone’s character abilities. For example, Doc draws seven cards instead of six, Ghost always plays his first card face down and Belle, everyone’s most hated saloon girl, can not be the target of shots or punches if there is another target. The character abilities are not perfectly balanced, but they are close enough that everyone has a chance. With all the chaos on the train, especially with six players running around, it can be hard to put together a working strategy. You always have control and your decisions matter, but one unexpected move by an opponent can mess up your plans. Often you can still come up with an alternative by moving somewhere else, but sometimes the general chaos doesn’t give you that option. And bad luck can get you in trouble, too. Whether it’s you drawing badly or multiple opponents finding no other target but you when shooting – remember, they have to shoot if they can, there’s no way to show you mercy – and mess up your deck with too many bullets early, sometimes you just don’t stand a chance and it’s not your fault. 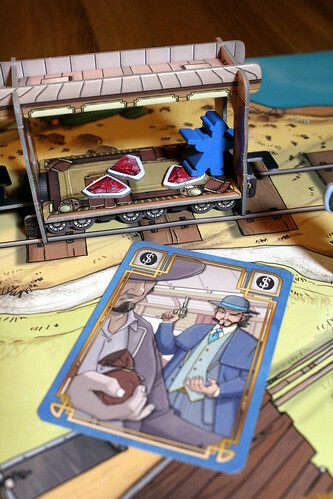 But Colt Express is a very enjoyable kind of chaos, with everyone running up and down the train like wild prairie chicken and making the best of their situation. This is a game where I don’t mind the luck, I don’t mind the slightly unbalanced characters and I really enjoy the chaos of it all. It helps that the 40 minutes playtime Ludonaute put on the box are on the long end of a six player game, with fewer players and everyone knowing the rules it can be done in twenty without rush. And then it’s twenty minutes of quick, intense chaos, with everyone having fun, and if you lost for bad luck you don’t have to care, there’s always enough time for another round. That is, if you can stand another twenty minutes of Benny Hill on a banjo.